This mini mod was born from my hate towards 33rdVA's yankeeness. In other words, not only are 33rdVA ugly, they also look like Yanks despite being Confederate! I took some models that are already in game and mixed them, creating this skin. The new unit doesn't look very original but I enjoyed it, so I decided to share it to the community. The mod will change 33rdVA's pants as well as jackets of 33rdVA private, skirmisher and sergant. It will also change the name of the regiment to 5th Virginia Infantry in unit selection pannel. Click here to download the mod. After downloading it, unpack the file into your N&S module folder. He looks the same, just his pants are a bit lighter than in vanilla. In other words, not only are 33rdVA ugly, they also look like Yanks despite being Confederate! I took some models that are already in game and mixed them, creating this skin. The new unit doesn't look very original but I enjoyed it, so I decided to share it to the community. The 33rd VA - Company E consisted of confederate veterans, which served in the US army. The US army uniform was navy blue frock coat and pants. There were quite a bunch of confederate soldiers, using blue as their uniform color! 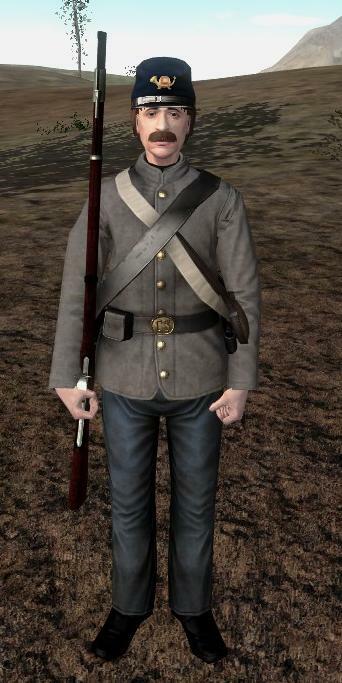 Even in 1862, most of the Confederate officers still used their blue pre-war officer uniform. something something yankees, something something mah states' rights, something something tyranny.